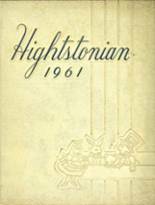 Listings of high school yearbooks for Hightstown High can be found below. You will find former students who are seeking yearbooks, those looking to sell a yearbook and general yearbook requests among the Hightstown yearbook listings. This yearbook section was created to help alumni post yearbook classifieds. I guess my son never gave me the notice got purchasing his 2009-201 yearbook and I would like to buy it for him. Is there any way of getting one now? Buy your used copy of the 1998 Hightstown HS yearbook. Only 1 available. Get it while it last! Buy your used copy of the 1995 Hightstown HS yearbook. Only 2 available. Get it while they last! Buy your used copy of the 1996 Hightstown HS yearbook. Only 1 available. Get it while it last! Buy your used copy of the 1995 Hightstown HS yearbook. Only 1 available. Get it while it last! Buy your used copy of the 1994 Hightstown HS yearbook. Only 1 available. Get it while it last! Buy your used copy of the 1992 Hightstown HS yearbook. Only 1 available. Get it while it last! Buy your used copy of the 1991 Hightstown HS yearbook. Only 2 available. Get them while they last! Buy your used copy of the 1990 Hightstown HS yearbook. Only 1 available. Get it while it last! I have following yearbooks available. Buy your used copy of the 1989 Hightstown HS yearbook. Only 1 available. Get it while it last! Help .....I lost mine..would love to have another to relive some good times and friends...looking to connect with any hhs alumni that remember me...peace! Buy your used copy of the 1986 Hightstown HS yearbook. Only 1 available. Get it while it last! i am looking for tommy morgan does anyone have information about him? I am interested in purchasing a Hightstown High School 1982 and 1983 yearbook. Please contact me by email if you have one you would be willing to sell. I graduated a year early in 1977 and I would like to see a copy of the 1978 yearbook. Looking for yearbook from 1976, I know that I'm not in it but would like to have one. Mostly looking for yearbook for 1976 but also happy to buy a 73,74 or 75. What would really be great is if we could get them from every year and scan them to view online! Does the library keeps such a collection? Looking for 1971 yearbook and 1973. I transferred in 11th Grade. Played Field Hockey & Varsity Softball. Need a clean 1963 yearbook with no writing inside. It will be scanned and the images used for the Class of 1963 50th reunion in 2013. The yearbook will be returned undamaged as soon as it is scanned. Have my old yearbook but reluctant to post it - not for sale.